It will be a day long remembered – again. 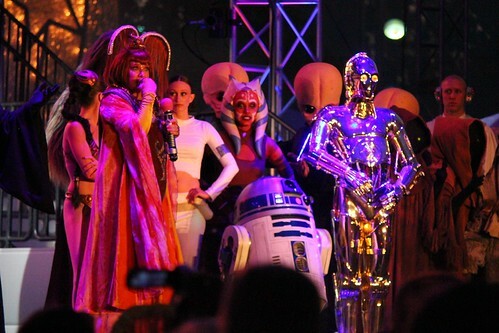 The annual Hyperspace Hoopla is here as Star Wars Weekends 2013 launches at Disney’s Hollywood Studios. 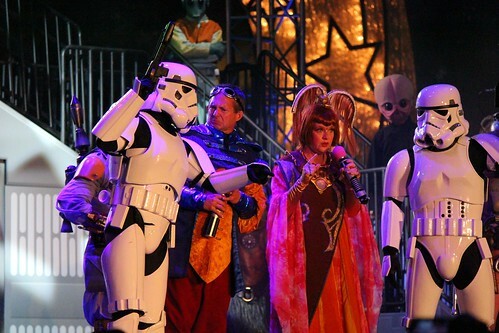 And as has been the tradition for many years, the Jedi, Sith, and other intergalactic creatures have taken to the stage to battle in the Dance-Off with the Star Wars Stars. 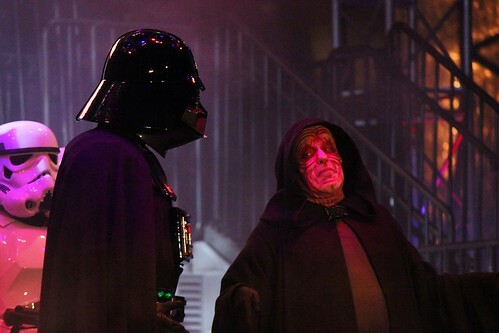 It’s the first Hyperspace Hoopla since Disney purchased Lucasfilm and Star Wars, but the show went on mostly following the same format as in previous years, with one big Disney-style surprise at the end. As the good guys face off against the evil Empire, this year’s performances includes Emperor Palpatine dancing to the Beastie Boys’ “Fight For Your Right to Party”, Darth Vader and Boba Fett breaking it down to Michael Jackson’s “Bad”, Chewbacca and Ewoks grooving to Outkast’s “Hey Ya” and, naturally, a huge group performances of Gangnam Style, the Harlem Shake, and even Sweet Brown’s viral hit “Ain’t Nobody Got Time for That.” Plus, Jedi Mickey makes a first-ever appearance with a surprise finale dance. And as with every year, the results are simply hilarious, as seen in the full videos below, followed by a few highlights. 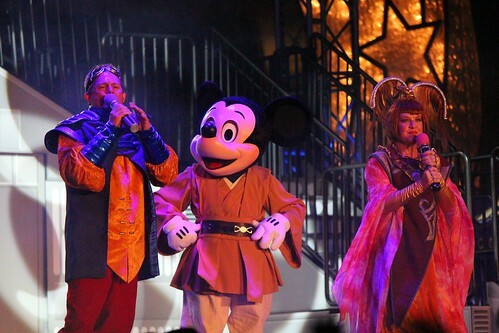 Jedi Mickey finishing off the show was definitely a first for Hyperspace Hoopla, but with Disney’s recent acquisition of Lucasfilm, it’s surely not the last time we see further integration between the world of Star Wars and Disney’s classic characters. 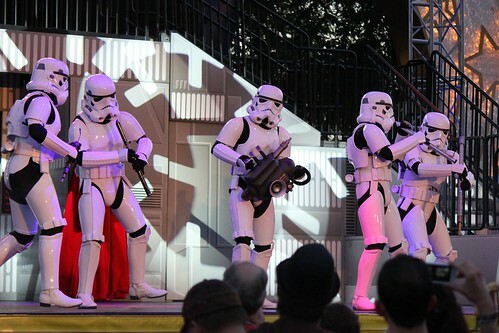 With Mickey’s appearance it’s clear that Disney was emphasizing that they own Star Wars now. 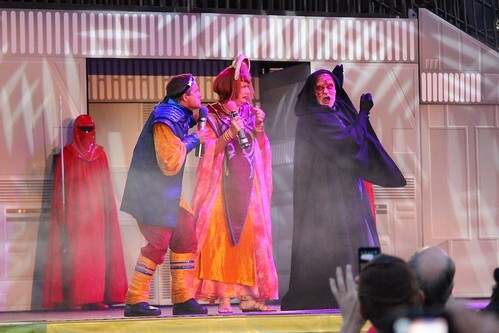 Need more dancing Star Wars insanity? 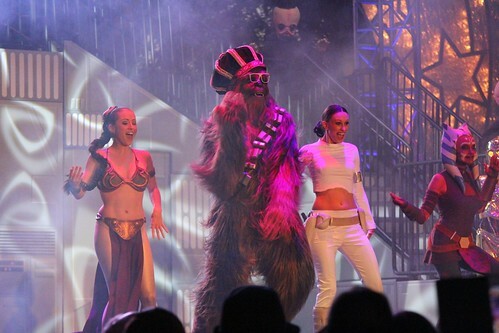 Take a look back at the Dance-Off With the Star Wars Stars from 2012, 2011, and 2010. 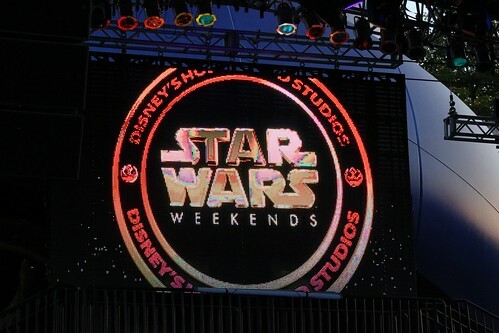 Each day of Star Wars Weekends ends with the Hyperspace Hoopla and Dance-Off with the Star Wars Stars on the big stage in front of the park’s Sorcerer Mickey hat icon, taking place every Friday, Saturday, and Sunday through June 9, 2013, included with admission to Disney’s Hollywood Studios. good show but cheasy compared to star wars films plus chewbacca the host of sw weekends really? Thanks Ricky! Looks like a lot of fun. Psy called for the deaths of American soldiers, their wives, and their children. When are media companies like Disney going to wake up and realize how offensive it is to military families to continue to play his music? your publish that you simply made some days in the past? Any sure? vous stand out. donc dépêchez-vous, aller surferet vérifier Out site maintenant. individuals is shopping. However, time is a luxury that the majority of people don’t have due to their hectic schedules. Fret no more since shopping online can be of great help for you to acquire the things you will need and need. The online shop website can show you the latest of RL collection. Each and every item is catalogued in a way that allows you to check out clothes and accessories in the most organized and convenient way. Leaving your home and workplace simply to shop wouldn’t be needed any longer. iManifest iMeditate Ezine,girlsuggbootsuk.sheynstudioWeekly ezine that functions articles or blog posts about manifesting the law of attraction,Jordanshoesforsale.taysidepolice, meditation,Bottines UGG Pas Cher, prosperity developing,New Jordan Releases, manifesting abundance, determination achievement. I’ve also been meditating for very that lengthy. I’ve truly began a newsletter just soon after I’ve put up my site,uggsandalsuk.yinsktmusa, but I was so hectic then I couldn totally deal with it.